The Khmer Rouge war crimes tribunal does not have sufficient funds to pay reparations to war crimes victims as stipulated in the event of a guilty verdict in the current Case 002, the Open Society Foundations (OSF) said Wednesday. 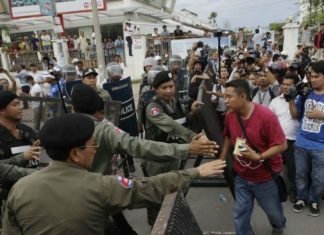 While the national side of the hybrid Cambodian-U.N. court is in the midst of a funding crisis, with more than 100 staff on strike due to unpaid salaries, the OSF said there is also a funding shortage in terms of the collective reparations 3,866 civil party victims are entitled to should war crimes suspects Nuon Chea and Khieu Samphan be convicted. The price tag for reparation is in the region of $2.5 million, according OSF, a lobby group which works with civil parties. “At the ECCC [Extraordinary Chambers in the Courts of Cam­bodia] reparations are limited to ‘collective and moral reparations,’ to ‘acknowledge the harm suffered by civil parties,’” OSF said in a statement. “The court says these benefits shall not take the form of monetary payments to civil parties themselves, and that sufficient funding shall be secured from outside sources if the accused cannot pay for reparations,” OSF continued. With both of the accused claiming indigence, the burden of fundraising for such reparations, which are slated to fund a national remembrance day for victims of the Pol Pot regime, public memorials, as well as rehabilitation projects and educational initiatives, falls primarily to the civil party lawyers, according to OSF. However, success in getting money from the court’s donors ahead of a judgment in the case has been difficult, compounded by the fact that the court’s national side is in financial disarray with the Cambodian government having failed to provide money to cover its share of the tribunal’s budget, the statement says. So far, there is less than $300,000 in funding toward reparations, according to a filing by civil party lawyers in August.